The Pearl Sister is book 4 in the Seven Sisters Series. While each story is unique and centers around one of the six sisters and can definitely be read as a standalone I feel that by the time the final book is out each of the sisters story should be read. What I love about this series is that there are not huge multi year gaps between each book but rather just a year or less which keeps the story fresh in my mind and the added excitement of the next installment. This isn’t a small book coming in at just over 500 pages, it might sound daunting but it was a pleasure to read. CeCe is one of the sisters I have been very intrigued with, her dominating spirit over sister Star has me wondering how and why she became that way. Though those questions weren’t thoroughly answered in this book her realization came to light. The Pearl Sister takes place in Australia mostly, the great outback. There we travel back in time to a young woman named Kitty, originally from England. In this book I found both the past and current stories interesting (usually I always have one preference over the other). I loved Kitty, I loved her determination, her compassion and watching her change after life throws obstacles in her way, she didn’t give up. The aboriginal people played a big part here, their treatment and lifestyle opened my eyes to what they went through. That’s one of things I love about this series is that the author takes us to different places around the globe where I can learn and visualize so much. As CeCe searches and uncovers her family history she discovers more about herself than she anticipated. The Pearl Sister is a well written family drama filled with love and loss, determination, culture and loyalty. It is a look at the pearl industry as well as highlighting real historical events. 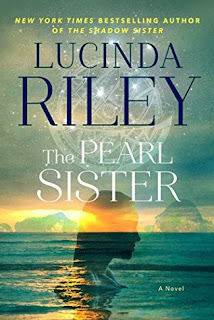 Lucinda Riley has taken on a big task with this big seven book series and I anxiously await the next installment (The Moon Sister releasing sometime in 2018). Thank you to the publisher via Negalley for an advanced copies of this book in exchange for an honest review. Click on the covers below to take you to my thought on the first 3 books in this wonderful series.